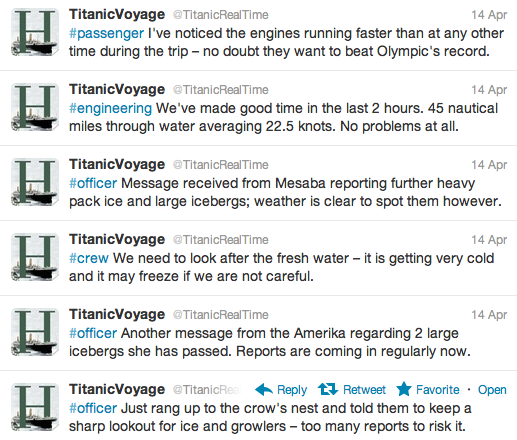 For the past few days @TitanicRealTime tweeted the events of the Titanic voyage in real time... just 100 years later. I found out after the fact, but wish I found out sooner because I would have stayed up all night reading along. Yes, I'm a sucker for event live blogging.. even if it's a semi-fictional recreation of an actual event that isn't "live" in any way, shape or form. Either way, this was REALLY COOL and REALLY WELL DONE. Click through the jump for a full breakdown of every perspective that was offered, or read the entire timeline at http://twitter.com/TitanicRealTime. The same group, @TheHistoryPress, is also doing a Whitechapel investigation live tweet session in August of 2013, but here's hoping these happen sooner and more often. As you probably already noticed, the hashtag (#) shows the person who the tweet represents. 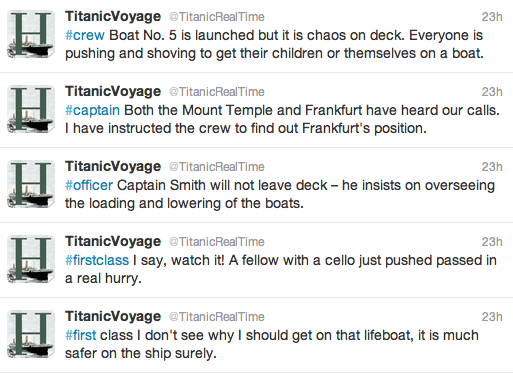 There were perspectives from the captain, officer, crew, first class, third class, etc.. If you click on the links below, it'll take you to the tweets from each individual perspective. It's an interesting way to follow along. Note: Make sure you are logged in to Twitter to use the links below. Otherwise Twitter gets wonky. this is amazingly affecting. reading the tweets in chronological order made me feel rather sick. This is amazing, thanks for posting it. What an incredible idea... look forward to the White Chapel series.